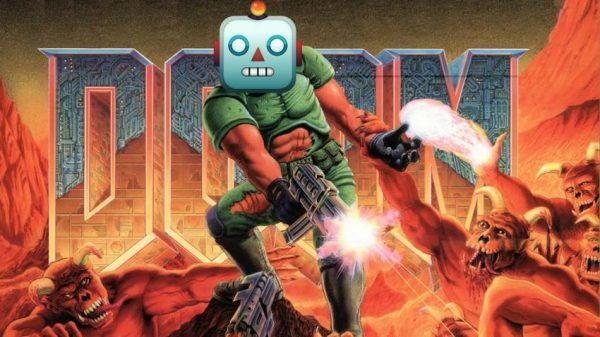 Computers, “Doom”, and Dreams « Adafruit Industries – Makers, hackers, artists, designers and engineers! You can see what this looks like on a webpage the researchers put up on Tuesday. If you need a description, imagine someone filming a game of Doom off of a CRT computer monitor with a glob of Vaseline smeared on the lens. The machine learning set up for this task had three components: First, a model that comes up with a compressed version of the game environment based on a snapshot (like a low bitrate MP3 or deep fried JPEG), and then another model that takes that information to output a probability distribution of what the next frame might look like. These two models, taken together, make up the virtual agent’s abstract view of the “world.” Finally, there’s a controller model that has access to the reward functions of the game to make choices about what to do next in the game based on the previous model’s predictions.